Pam’s Pictorama Photo Post: Bad Kitty! No scratching! How very many times have I repeated that phrase? Like all cat people, ours is an uneasy treaty with our little wild animals in our one room apartment version of Eden. We are loath to allow the destruction of beloved antiques (oh those caned chairs – like this fellow is going at) or expensive couches and rugs. I love the little devils more than any piece of furniture, but it can get expensive and annoying. There are scratching posts, cardboard boxes with catnip and whatnot where scratching is sanctioned – encouraged in fact. Obviously, declawing is not a phrase we utter in this house. Like bunnies and beavers which have to nibble and gnaw in order to keep their teeth filed, I guess cats need to scratch to keep their claws sharp and from getting too long. Still, scratching is more than that to a cat – there is joy to scratching. Scratching is a way of marking your turf – it’s a statement. As shown here – it is both a cross cultural phenomenon, Mr. French cat, and one that goes back quite aways. Blackie is the first cat of my acquaintance who appears to not have so much as a clue as to what the various scratching devices scattered around our tiny apartment are to be used for. He watches Cookie happily scratching away – putting some real back into it. But he has never so much as taken a side swipe at one of them – I have tried every type: cardboard, carpet, rope, large, hanging and on the floor. We’ve showered them in catnip – tried running his feet across them. If anything he seems horrified by them. This does lead to some friction. I occasionally tell him he would be a PERFECT cat if only he could figure that out. 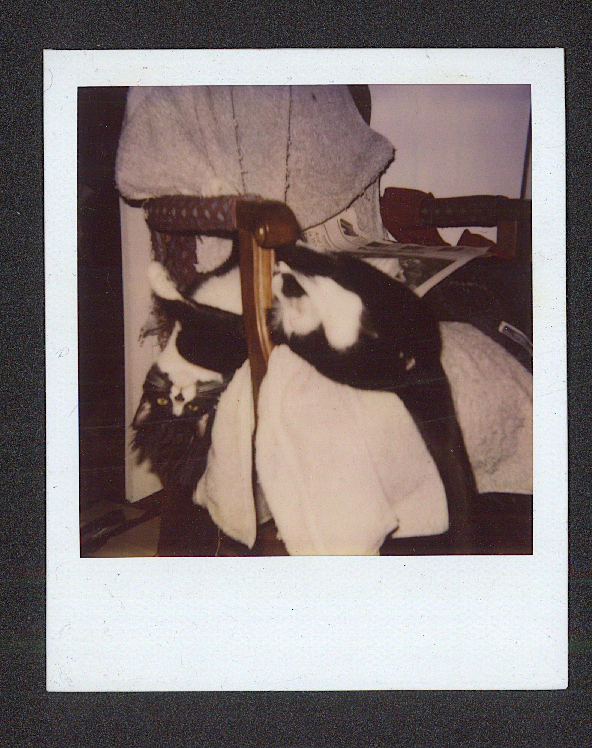 Meanwhile, although my cat Otto knew all about scratching posts and employed them, she had a fetish about Kim’s work chair. 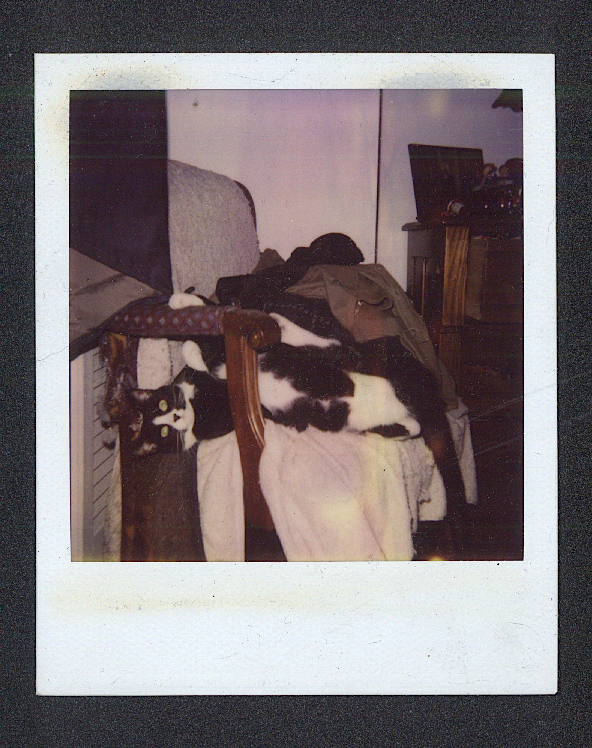 She is shown below, in a former apartment, in a series of polaroids Kim took over several days in April, 1995. Evidently she would take the chair on every day at the same time. 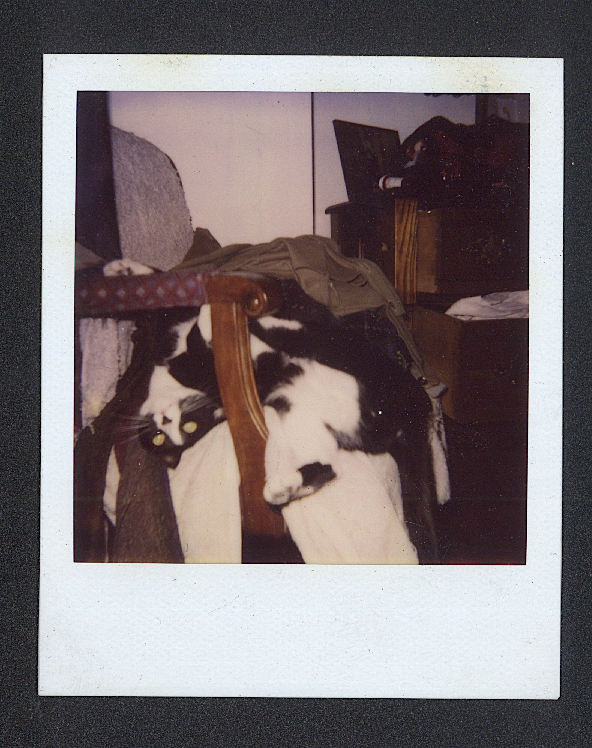 Needless to say, she eventually denuded the entire chair. Kim continued to use it however, until the frame too fell apart one day, years later.